I found this little book on the Internet. 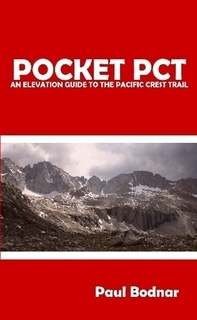 It’s called “Pocket PCT— An Elevation Guide it the Pacific Crest Trail.” It weighs 3.8 oz(108 grams) and covers the entire trail. I’ve never used it or even seen it but it looks really useful. I may try it out the next time I hike the PCT. It cost 19.95 which is 10 dollars more than the Wilderness Press PCT Data Book but I was thinking it might be more accurate. The Wilderness press data book is missing some important water sources and it doesn’t always show you when you are at the top of a climb. The Pocket PCT is built around an elevation profile of the entire 2655 miles of the Pacific Crest Trail from Mexico to Canada. The mile-by-mile elevation profile is represented in chapters, each beginning and ending at a common resupply location. The detailed profile shows water sources (each rated by reliability), water cache locations, resupply points, and hundreds of other landmarks such as campgrounds, roads, creeks, rivers, and trails. Symbols identify each point of interest and includes that point’s elevation (and directions if off-trail). Commonly used resupply point addresses and other information is included in the back of the guide, including directions to each resupply point from the trail. I met Paul on the trail this year doing some trail magic in exchange for feedback on his elevation guide. I hiked with a printout of it for a few hundred miles and found that the elevations were way more accurate than the PCT Atlas I carried. Paul said something about his elevation marks being taken every 1/4 mile or so.